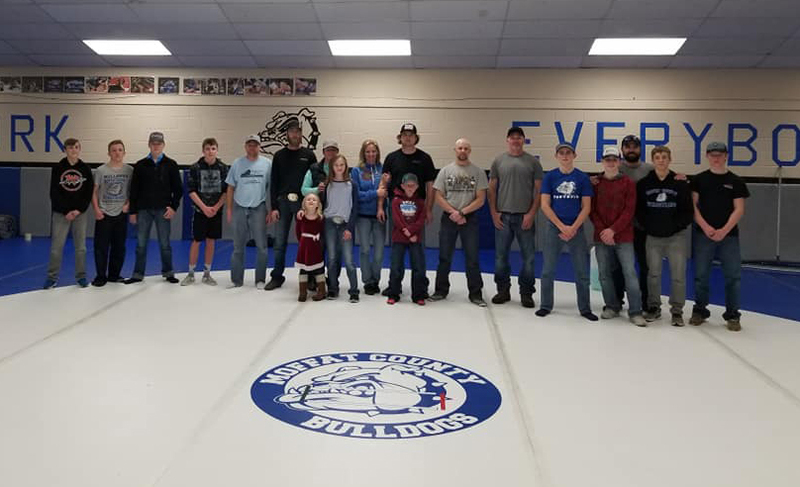 Moffat County High School wrestlers, coaches and family members display the new mat on the floor of the MCHS wrestling room. With a few hours of work, Moffat County High School wrestlers made equipment upgrades this week that should last for years. MCHS athletes, coaches and families spent much of Sunday installing a new mat in the school’s third-floor wrestling room. Head coach Dusty Vaughn said the package purchased by the program includes both competition and practice mats, which, though not cheap at about $19,000 in funds raised by the team, should last for 20 to 30 years with proper care. The equipment is emblazoned with the Moffat County Bulldog in its center on a field of blue and white. 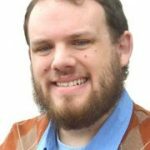 “We let our team vote on what the design and look would be, so they kind of get to leave their mark on the program in that respect,” Vaughn said. The volunteer day involved installing the new mats and removing the old ones, with Vaughn noting the amount of work done by members of the program to make the process go smoothly. He added that other renovations he’d like to make in the near future when possible are to update the mats on the walls and convert the hallway into a literal hall of fame honoring MCHS grapplers who have placed or won at the state level. “I’d like to highlight more of what this program is all about, where it’s been and where it’s going. It’s such a great tradition,” he said.